This is a picture Claire drew for me this weekend. Most people (even doting mothers) would admit that there is nothing spectacular about this simple drawing. But if you know Claire, then you know that this piece might as well be the Sistene Chapel! See the blue at the top – that’s the sky. See the sun? See those blue and red people? 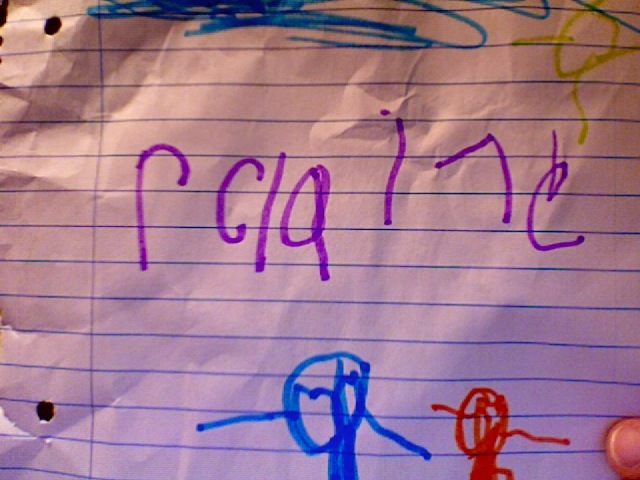 And, look, that is Claire’s name (almost) written at the top in her favorite color. Here’s why its awesome: Just a few months ago, Claire couldn’t remember the letters in her name or get even close to writing them in a way that they could be recognized on a page. Even though she is nearly six, because of her too-early start as an extreme preemie, she has been playing catch-up for all those years. Her sister is 15 months younger and can spell her own name and all of her friends’ names in perfect capital letters. With Claire, we’ve been working solely on that five letter name for MONTHS! See the “r” in the front of the “C”? She put that one there because the “r” in the name the first time was “wrong”. This picture is quite possibly one of the best things I have seen for a long time! Now, think about yourself. You may feel like the drawing of your life is a little messy and unrecognizable. But hang on! If what you are becoming is better than what you were, then your’re moving in the right direction. And God isn’t just looking at your accomplishments and saying, “Wow. That could be better.” Nope. He’s probably posting you to his blog right now! Oh, I love this post so much! Tears here. Huge, happy tears. Claire ROCKS. Felicity, you and Serenity have both hit home runs on your blogs FOR me today–I needed them sooooo bad. WAY TO GO CLAIRE!!!!! Yes, tears. Felicity you are an awesome mommy. Claire wouldn’t be as far if she didn’t have a mom (and dad) that would take the time to work with her on her name! God is posting about you, too! Puddles. I’m so thankful to Claire for reminding me today that God allows do-overs — that’s is a really nice “r” by the way! No comment here. Just tears!